Very good. New and unread however some shelf wear to edges of cover and corners. Peeling to top right corner of cover. Slight bumps to edges of cover. Good. Fast Dispatch. Expedited UK Delivery Available. Excellent Customer Service. English language. I loved this book. I read it while I was subbing in a junior high English class (it was the assignment the teacher had left), so I actualy got paid to read a fun novel. How fantastic is that? I especially loved the old west bits, and how it all ties in together. I first picked up Holes when I was a third grader.Right now I'm in 7th and have read that book countless times. It is amazing! By circular, I mean, everything fits together in the end. It's one of those stories where multiple things are happening at once, many of which do not make much sense or do not mean much until later on. It's an element that makes this book so irresistibly. Alongside sympathizing with the protagonist Stanley who was wrongfully accused of a crime, the readers learn the complexities of history and how it ties in to the present. Perhaps, bad luck does exist. But luck isn't absolute. I'd definitely recommend this for the late elementary school-middle school audience. It's a nurturing perspective for the growing mind of a child. Loved it growing up! 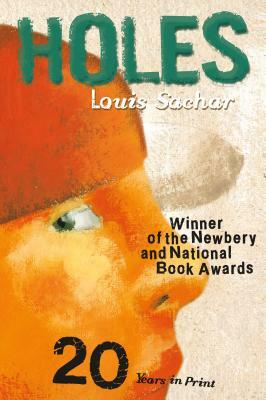 I received Holes by Lous Sachar as a gift. I made the mistake of starting to read it around 9 PM. I literally couldn't put it down until I couldn't keep my eyes open. I have also given it as a gift to three different people. I have never received a more positive unsolited response from any other small gift I have ever given. P. S. Lous Sachar, wherever you are, may your tribe increase!